In spite of the rain and flooding, the 2006 Hatch Valley Chile Festival will open as planned. The cost of the Festival is $5. One dollar of the fee goes to a non-profit fund for the victims of the recent flooding in Hatch. This is the 35th annual festival. 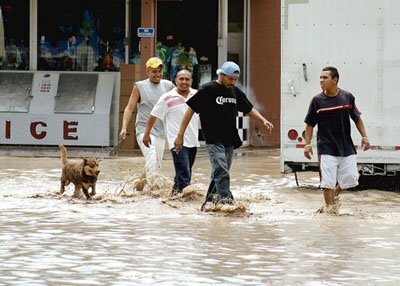 The big news in Las Cruces, and all of southern New Mexico, is rain – and flooding! The yearly average for Las Cruces is about 6.5 inches. So far this year, the Weather Service has reported 9.7 inches. But many local areas have had much more rain than that, some by 3 or 4 inches. It is quite common for rain to fall heavily in very localized areas. 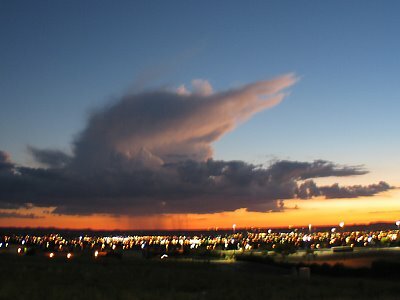 Here’s an example, taken today at sunset, looking over Las Cruces to the West. 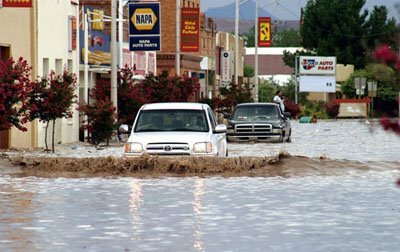 The flooding has been severe in Hatch, New Mexico, and in some of the areas surrounding Las Cruces. Hatch is famous for its green chiles — in fact, few in New Mexico doubt that Hatch produces the finest chiles in the world. Have the chiles been harmed? So far, not too much. But prices are already higher.